Discussion in 'Tutorials and How Tos' started by Superquad7, Apr 3, 2010. Tutorial credit goes to TFW2005.com member, jasonmako. Thanks for your contribution! So today I bought a mint Bombshell Insecticon to re-paint. After looking him over, there was absolutely no correct way to paint around the arm joints with out taking the pins out. After deep thinking about what could be used to support the underarm without ruining the design or plastic, a light went off and Sculpey III was the answer. 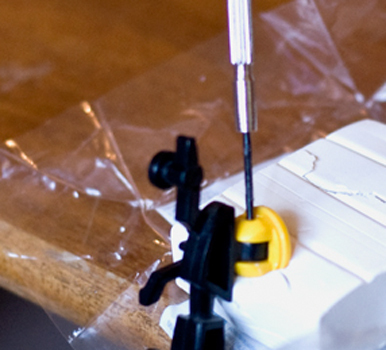 Its hard yet soft, conforms to the plastic pieces, and will take the impact of the pin being hit out. Hope this tip helps you with those non-flat parts. Will storing Sculpey III in a zip-lock bag prevent it from drying up? I've kept mine open in the fridge since i made the post and its still good! *snip*Which specific stores sell this stuff? I have a piece of soft pine I use to get them started if the are really, really tough. But for the most part i use a spring loaded center punch. It needs no backing, just hold the part, put the tip to the small end of the unknurled end of the pin, and push. The center punch will snap, and push that pin right out. Definitely one of the handiest tools I have for this hobby.